For those who are not sure what makes a school Title 1….Here it is: 40% or more of the student population qualify for free or reduced lunch/come from low income families. That’s it...the only qualifier, yet somehow...in the minds of many...Title 1 means: A school with families that don’t care about their children’s education, kids that misbehave/bully/fight, sub-par educators that don’t really care about kids, lack of parent involvement, lack of community support, lack of ability, and an overall horrible place to go to school. I have to ask...Why is this? Here is what I know - here is what I believe - The amount of money a family makes does not dictate the level of care or support they offer. 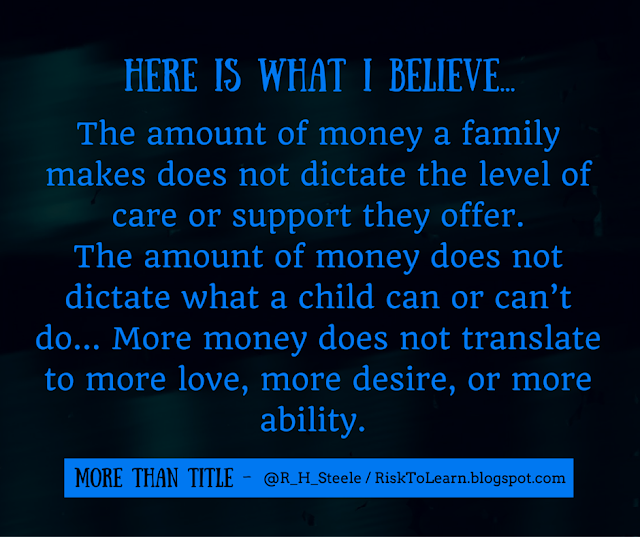 The amount of money does not dictate what a child can or can’t do. More money does not translate to more love, more desire, or more ability. Let’s be honest: Title 1 schools do have challenges - In fact, according to the Marzano Center the three largest challenges facing Title 1 schools are the following: RTI interventions are not sufficient to prepare struggling students for college and careers, new standards require whole-school alignment, and lagging indicators of student achievement are too little, too late. Bright Hub Education suggest teachers in Title 1 schools face students with multiple distractions. They point out that some students are working part time jobs to support their families, are facing real world challenges, may feel it is impossible to break the chain of events they see in life, know someone in jail, use food stamps to buy food, often go hungry, or lack parental support thus requiring the teacher to often act as a cheerleader or confidant. There is no question there are challenges in education, and that many students from Title 1 campuses do come with less than those in more affluent situations. There are heart-breaking stories, families just trying to get by, parents working multiple jobs thus missing time with their children, as well as family members at home unable to read/write. Yet, in the end...regardless of the struggles, regardless of the challenges, remember this….we are more than Title. The response “Everyone knows that Title schools are the bad ones” breaks my heart. There isn’t a soapbox large enough to support my belief that Title 1 or no, our kids are amazing, our teachers are nothing short of phenomenal, and our community is one built on the belief that we are all in this together. So to anyone with the same question as my friend, let me be clear. The decision to have your children attend your local school should not be based on whether or not it happens to be Title 1. Visit the school, talk to the community, contact the principal, and be ready to learn about the amazing things that are happening...because I assure you - this country is filled with schools that are much more than Title. Great defense of Title 1 schools. Your conclusion is heartfelt and spot on. As a T at a Title 1 school, I agree . . . we are more than a "title." I wouldn't want my boys at any other school than the ones they attend/attended. Good parenting has nothing to do with $. One of my most impressive students, of all time, was a recent immigrant from Mexico. Her dad was a painter and her mom was the most amazing, delightful, joyful person, who would happily muddle through the language barrier, while talking with me every morning. The little girl came in with no English, and by the end of the year, was one of the highest students in the class. Well said, Ryan. You are spot on about families. I do believe Title 1 schools require more support from their school districts in terms of funding and teacher allocations to support RTI and level the playing field. I taught at what I would call an "entitled" school for 3 years. Several S's (and families) felt like they were entitled to everything! I loved my kids, don't get me wrong, but being a teacher in a "rich" school was not for me. This year I switched (by CHOICE!) to a Title 1 school and it is AMAZING the difference in S's and what they expect, or should I say don't expect. They don't stand at my table demanding a snack because they don't have one. If they don't have a snack, they quietly get a book and read. Being at a Title 1 school has opened my eyes and I am SO thankful and blessed to see what kids are going through and know that I am here to help them. Your article was so well written, passionate, and I can tell that this is something you truly care about. Several times I said "AMEN!" out loud while reading it. Thank you for sharing, for clarifying, for defending, and supporting our field, teachers, students, and families. Funny- I JUST had this conversation Friday at the parent/teacher conference at my daughter's school. I know too many people who assume their kids are fine because they go to a "good" school (be it a private school or in a wealthy part of town) and check out as a parent. It's always a shock to them when they realize bullying, teen pregnancies, drugs etc aren't respecters of income level. How Do We Reach All Students?